After asking industry leaders about all the issues we thought would matter most in 2015, we asked them what questions they thought we had missed. Here is what they told us. • What are some of the non-traditional approaches to communicating with HCPs that are being adopted? – Field customer service representatives – who support HCPs and their practices with samples, patient education materials, reimbursement information, etc. – Field clinical nurse educators – who provide much needed support to improve health outcomes. – Live video and tele-sales representatives – who engage HCPs on-demand and by appointment and often at times that are preferred by the HCP (such as after office hours). – Virtual credentialed sales specialists – Pharm.Ds, Ph.D.s, R.N.s, M.D.s, etc. – who can engage HCPs in high-science discussions through virtual channels such as live video or phone. – Virtual clinical nurse educator teams – which fill a similar role as field nurse teams help to improve health outcomes and patient adherence by communicating through live video, phone, and live chat. – Live-chat care counselors – who support patients with health information upon request via click-to-chat features. – Hybrid teams – who work in defined geographic territories, but who reach their target customers through a variety of channels (face-to-face, phone, and video) and at times that are preferred by the customer (including after hours). • The pharmaceutical industry has and continues to undergo profound change. Do agencies need to change too? If so, how? 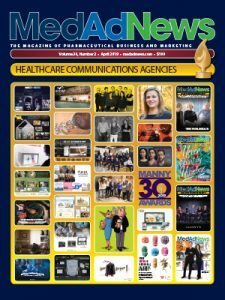 Historically, agencies supporting the pharmaceutical industry have largely focused on creating and delivering communication – both directly through advertising and medical education (among others), and indirectly through the media (public relations, for example). This has served all of us well … until, to be frank, the turn of this century. While communication is still an important part of an agency offer, it can no longer be the end goal, even when augmented with the very latest digital technology. It should be viewed as just one of the means to a new end goal: behavior change. In order to best support today’s and tomorrow’s pharmaceutical industry (and indeed all those with a vested interest in health), the healthcare marketing industry needs to focus on behavioral science with the same passion, rigor, and integrity that we have always done on biomedical science and creativity. And this is exactly how things are progressing at the agency level. Goodbye “belief shift” hello behavioral pathway. Goodbye creative brief, hello “do” brief. Goodbye detail aid (well, almost), hello clinical decision making. And the list goes on. It isn’t always easy, because change isn’t easy. But it is hugely rewarding: bringing about pervasive creativity at the intersection of biomedical science, behavioral science and digital technology to change health behavior to improve health outcomes. Welcome change. • Faced with increasing regulatory limits on the use of bold, comparative claims, what can frustrated marketers do to differentiate their brands? If you’re finding it hard to make bold, differentiating claims in today’s regulatory environment, you’re not alone. And that’s no small problem because differentiation is at the very core of effective marketing. The challenge, then, is to differentiate differently. And the good news is that a shift in focus offers unlimited opportunities for success. While our industry as a whole has been quite adept at communicating on an intellectual level through the use of positioning and messaging, we have been far less sophisticated in reaching beyond the intellect to affect the emotions. This is a serious oversight when you consider that 1) emotion is at least equal to reason as a driver in the decision-making process, and 2) brand personality makes an immediate impression, long before the audience has a chance to consider your message. Best of all, brand personality, unlike claims and messaging, provides an unobstructed path to differentiation. Bottom line, by focusing equal attention, discipline, and analysis on both the intellectual and emotional aspects of branding, you can effectively double your impact while ensuring that your brand is differentiated well beyond what data and claims alone might achieve. • Do field iPads live up to the hype or are drastic shifts needed? In the past two years, the industry has spent heavily to ensure that marketing materials for each brand are on each rep’s iPad. In our benchmarks, TGaS has seen a broad spread of effectiveness in these interactive visual aids (IVAs). In some companies, use of an IVA has indeed shown an incremental lift in scripts over other forms of detail aids. Other companies are still struggling with getting their IVAs used at all; utilization can drop below 10 percent for some brands. In TGaS benchmark work, most IVAs we’ve seen are worse than using paper. What’s more, to develop these IVAs, the average investment is $435,000 for each brand, which is above and beyond the cost of the printed detail aids. Many organizations will course-correct in 2015, using these devices where and how they provide benefit, rather than “checking the box” and delivering mediocre benefit at a high expense. • How will pharma’s drug development process adapt to new demands for value from stakeholders involved in healthcare delivery? Creating a successful drug in a value-driven environment will present new challenges to pharma companies who have been traditionally focused on success through superior efficacy and safety data. With the changing healthcare environment, success for a new product requires not only demonstrating positive clinical results, but also demonstrating real-world efficacy and cost-effectiveness. This will be the new target for differentiating new offerings from other products and competing pipelines. For pharma to accomplish this new goal, it will require a shift from just focusing on brand clinical development to taking a more solution-oriented approach. This means addressing not only the unmet needs of the disease with a targeted molecule, but also addressing the overall unmet needs of the patient with a targeted and comprehensive solution. These solutions must build upon the current skills and processes in place within pharma. In parallel with clinical trials, pharma must do a better job of understanding and addressing underlying drivers of HCP prescribing behavior and patient self-management through tools and interventions that can be studied in combination with pharmacologic therapies. Clinical trials should also evolve to include real-world outcomes and relevant patient-reported outcomes as metrics of disease management in a patient’s everyday life. Prelaunch planning will have to move beyond basic data dissemination and disease awareness and incorporate skill-building efforts for HCPs and patients that will not only help maximize uptake but also optimize patient outcomes. Pharma has a history of bringing new and innovative therapies to market. This underlying spirit of invention is an excellent foundation for withstanding the pressures of a value-driven system. But to be truly successful, it must be enhanced with a holistic understanding of HCP and patient drivers and barriers that may influence outcomes. • What is the future of the pharma sales rep? The vast majority of pharma companies are attempting to reorganize their internal functions as well as their respective sales forces around who they consider to be their key customers. These are complex organizational transformation exercises that require serious investment in hard assets such as information technology infrastructure and reengineering of commercial processes. One area though that remains elusive is defining and obtaining the right sales skills required to engage with customers. The traditional sales call is becoming less and less relevant. As much as pharma companies have reduced the sizes of their sales forces it is still common to notice redundancy in sales calls. Vacant territories’ performance rivaling the performance of filled ones is a telltale sign something is amiss. It is hard to let go of the tried-and-true sales approach of reach and frequency, flooding the market with ever more product details to maximize “share of voice”. What pharma needs to think about though is what is the definition of this “voice”. A face-to-face interaction is no longer the only way a drug manufacturer interacts with physicians. Patients receive expert physician advice online or at least vital information from medical sites. Physicians exchange opinions on treatments and refer patients in online forums. Patients support each other and describe their experiences with different treatments online as well. There is a vibrant world of interaction outside the realm of the physician’s office that requires timely support and accurate information. Meanwhile, the personal touch of a close partner from the drug manufacturer’s organization is acutely needed to address complex clinical, patient financing and treatment management questions at the IDN and ACO level. Old habits are hard to get rid of, but drug manufacturers should invest their efforts in maximizing the use of their people talent in customers that require customized patient population solutions while ramping up their efforts to provide alternative ways to support individual patients and physicians exactly when and how they need it most. • How can marketers do more with less? In addition to having to meet customers’ higher expectations, life sciences marketers and sales reps are taxed with meeting these expectations in the most effective way. The answer to this challenge is more robust customer segmentation combined with coordinated, cross channel execution – just as some of the Top 10 pharmaceutical companies are implementing today. Marketers need more robust customer data that goes beyond script volume to help inform smarter, more strategic customer segmentation and efficient resource allocation. For example, they need to understand each customer’s preferred communication channels and key message response. Armed with this data, marketers can fully leverage all of today’s digital channels, reallocating resources in a more intelligent way to cut costs and improve customer relationships. Companies may be surprised to find that high script writers prefer email over face-to-face interactions, allowing marketing to focus more email campaigns on this group and re-allocate the sales rep to another key segment. The key is equipping commercial teams to execute a logically progressive customer journey that includes both personal and non-personal interactions. Collectively in sync, each individual channel’s overall effectiveness compounds as they build on each subsequent communications with the customer – similar to the shoe example. Already, many life sciences companies have adopted this model and the technologies needed to enable this level of data capture for improved marketing allocation as well as improved customer relationships. This will raise the bar yet again, so marketing teams cannot afford to be left behind.